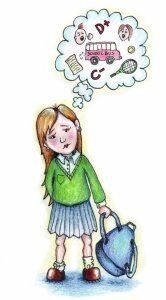 All children experience periods when they don’t want to go to school. A school phobic child has many days when they miss school usually for vague reasons. The child does not act happy or well with symptoms common to anyone who is worried. These symptoms include vomiting, diarrhea, fatigue, headache, stomach, and dizziness. These children are afraid of leaving home and growing up. They come from normal families who represent the best of child care and concern. They provide all that is needed to develop in a loving family. The child finds it difficult to leave home. Different reasons might appear on the surface such as a difficult teacher, a class bully or an embarrassing experience. The reason behind these superficial issues is the child lacks the self-confidence to leave home and develop on their own without the family or parents. Some children who seem to show the highest risks for this behavior is an only child, the last child or a child with chronic illnesses. Treatment for this behavior can include these type of objectives. The child must return to school and must attend daily. After a very short time their confidence increases and their enjoyment of school increases. Expect your child to be reluctant to return to school and remind him or her of the importance of school. You are required to send them by state law and you or your child would not want to violate the law. Each day their confidence will increase and their reluctance will disappear. Each morning the child may complain of various complaints that increase as the time to leave for school approaches. Send them to school anyway. Don’t ask about illness because that might set up a situation in which their complaints reappear. If one parent is better at the discipline necessary to enforce school attendance then it will be their task to be the primary person to reinforce the message for school attendance. It sometimes helps to travel to school with one or more school mates. If there are major concerns about the wellness of the child because of new complaints or severity of complaints then it would be important to have the child seen the same morning. If all is proven non serious then a return to school can be arranged later the same morning or at noon. It will be helpful to discuss the situation with the school nurse who can reinforce the return to class after a brief rest or attention to the complaints. The school teacher will need to know so that particular activities that produce great anxiety can be avoided in the beginning. The school is experienced with children who have fear of school because it is a common occurrence. A useful tact to take is to increase your child’s play time with classmates and school friends. It is understandable for parents who like to spend time with their children to be reluctant to give up precious hours. But it is essential to build up the child’s self confidence away from the family structure and security. Consider invitations of classmates to the home. School related activities are encouraged. Most school phobia is worked out over time without psychological or psychiatric counseling. If you feel you have exhausted all your options then I will be happy to discuss a therapist for the child and family.